JOB done. Probably the best horse in training did what he always does as Douvan made nearly every yard of the running, jumped perfectly at every fence and then ran the finish out of his rivals without coming off the bridle to win. 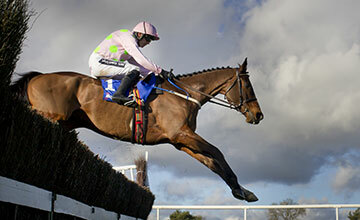 The 1-14 favourite, Douvan did not need to do anything out of the ordinary to win, and he will head to the Cheltenham Festival next month with the expectation of all that he will add the Betway Queen Mother Champion Chase to his wins in the Racing Post Arkle and Supreme Novices' Hurdle from previous meetings. Ruby Walsh, who partnered the winner for owners Rich and Susannah Ricci, told At The Races: "He's deadly isn't he? I thought Smashing would go a bit quicker but he wasn't up for it today and he never really took me. "He sauntered along in front doing his own thing before I gave him a squeeze at the back of the second last and he jumped out through the bridle. He won as he liked but he did what was expected of him." He added: "He has a huge amount of natural ability and he's a pleasure to ride. You don't have to do anything, you just sit there. If he wants to go in, he goes in and if he wants to stand out then he stands out. You just tactically ride the race on him and he handles the jumping. He's a wonderful horse." Douvan detractors - of which there are a few - will point to the fact the seven-year-old has not faced a horse rated within 10lb of him and that his only feasible rival Smashing was pulled up in the back straight. However, there was nothing not to like about how Douvan went about his business from the front, and he is no bigger than 2-5 for the Champion Chase. Douvan will head to the Cheltenham Festival next month as one of the hottest favourites of all. It is not an uncommon position for a horse trained by Willie Mullins, as the table of results below shows.